Watch an overview of how concrete was incorporated into the overall design of this retail center. The developer's goal was to immediately create a sense of place for a new retail center which would feature high end shops and fine restaurants. 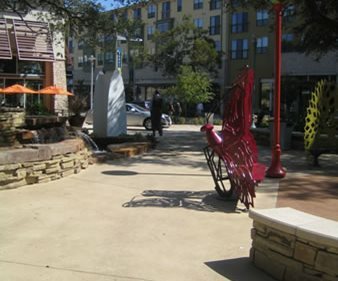 To meet the goal of providing a destination shopping experience unlike anything in the Austin, TX vicinity, the streetscapes, plazas and amenities had to have the cache to attract visitors from the nearby single-family neighborhoods which include the very affluent high-tech corridor. It must also serve the apartments and condominiums which would soon be available within the development. The goals, both market-driven and design-driven, were achievable due to the clout of Simons Property Group, Inc., the largest public US real estate company. They selected Austin, the Texas state capitol, because the housing market is one of the most buoyant in the country. Situated in an older neighborhood in northwestern Austin, the retail area in The Domain is one component of a mixed use development encompassing 57 acres in the first phase. The older area is being "reinvented" as part of a massive, multiphase project which will add more than a million square feet of retail space, restaurants, offices, apartments and services for the area. The developer wanted first impressions created by the streetscapes and plazas to convey a sense of permanence and luxuriant quality, as well as complementing the architecture of the retail structures. They also required greater durability and longevity than is typical. In addition, mature live oak trees already existing on the site had to be preserved and balanced with additional large trees. 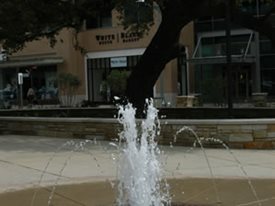 Unlike the enclosed malls common in the hot Texas climate, comfortable outdoor gathering places and walkways for pedestrian use were envisioned to provide an inviting pedestrian appeal. While indoor malls have been popular for several decades, the developer elected to create outdoor streetscapes, passageways and promenades with two goals in mind: reducing the extravagant energy expense of climate control for large indoor malls and creating a sense of community at street level, befitting a mixed-use project with a significant residential component. Simons Properties engaged the award-wining landscape architect, J. Robert (Bob) Anderson, FASLA of Austin. Holding both a B.S. in Park Administration and a Masters Degree in Landscape Architecture, he is noted for his ability to create a multi-layered sense of place that is both cosmopolitan and sympathetic to the regional character of Texas. The design scheme developed by Anderson was inspired by the pedestrian-friendly plazas and meandering streets of the old world which have evolved slowly, over centuries. Although, this would be a new development, the goal was to create hardscapes and patios that appeared timeworn from the outset by using rich, natural colors and custom amenities. As the landscape architect Robert Anderson says, "When the places we walk have character, we walk slowly to savor the experience. We pause to enjoy our surroundings. Recreating the welcoming aspect of age and antiquity at street level, such as that found in Europe and Mexico, was our goal for the retail environment where we wanted people to enjoy lingering and relaxing in public places." The pathways were designed to curve gracefully to integrate the large scale trees. Patios and walkways were situated to benefit from shade and be refreshed by micro-climates created by custom-designed water features. The landscape architect specified high performance concrete with two integral colors: Uni-Mix Integral Concrete Colors in Lannon Stone and Harvest Wheat. The Harvest Wheat was used as the unifying color for approximately 60,000 square feet throughout the project. According to Scott Bauerle, owner of Sco-bar Hardscapes, "The concrete reached a PSI of 4000 because we increased the cement content which also gave us a creamier and smoother texture. For a custom look, the joints were all tooled with a hand-groover, not saw-cut. All the integrally colored concrete was finished with a natural rock salt finish. The concrete was then cured with a water-based curing compound, and sealed with a water-based sealer to protect the surface." The landscape architects required the use of a hand-groover to make the joint pattern prominent, providing visual breaks in long expanses of paving. Color also is used to direct access to the store entries, and to improve safety. As visitors approach the street crossings, red indicates they are moving off the sidewalks and into the roadway. "At The Domain, the warm, earth tones create a welcoming environment," according to Mr. Anderson, "color has a psychological impact on us, and it is important to avoid the traditional coldness of grays. The quality in every detail of the tiled benches, the custom fountains and sculpture all contribute to the beauty of the environment which makes visitors want to stay to shop, dine and just enjoy the attractive surroundings." The Domain became an immediate sensation at its opening with seventy-five upscale stores and nine fine restaurants, surrounded by inviting walkways and gathering places. 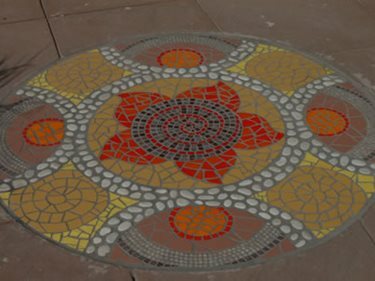 At The Domain, the warm hues of colored concrete evoke an old world charm which seems appropriate for the custom-made mosaic embellished benches and artistic iron railings reminiscent of the Spanish style. Decorative concrete at The Domain is subtle enough to be a backdrop for upscale amenities such as sculptures by local artists, interesting native plants, soothing water features and inset hand-cut stone. Perhaps the secret of success is that the colored concrete does not call attention to itself, but blends softly into the background, whispering its welcome.